TheNumark iDJ is a 2-channel mixer that enables mobile DJs and iPod enthusiasts to seamlessly integrate their portable music libraries with other music and sound reinforcement systems—transforming the iPod from a personal music player into a source playback device. With its compact form factor, comprehensive feature set, and a blue on white aesthetic appeal that blends perfectly with the iPod, the iDJ makes the music more accessible and the party better than ever. 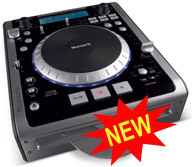 The Numark Axis4 tabletop CD player offers professional features at an introductory price. The two seamless loop points and three stutter starts allow for endless creative options. An included tap BPM counter simplifies beat-mixing, while features like fader start encourage the user to take their skills to a new level of performance. The durable steel enclosed unit has been meticulously crafted with life-extending features such as a laser shutoff mode and auto-retractable media trays. 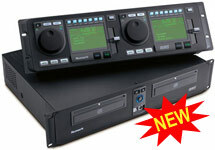 Designed for a variety of applications, the Numark MP102 CD player is a rackmountable solution to a wide variety of music playback requirements. 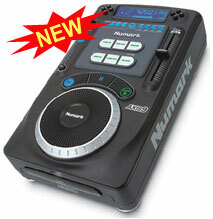 Numark’s MP102 plays standard audio CDs and MP3 CDs, provides buffered Anti-Shock™ memory protection, delivers seamless looping for both CD audio and MP3 files, pitch control with a pitch bend wheel, stereo RCA and digital outputs, and balanced outputs. 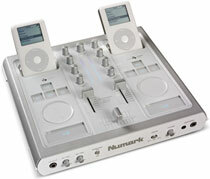 The AXIS9 is Numark’s new flagship tabletop CD player. Featuring an enhanced interface that employs a touch-sensitive scratch wheel, the AXIS 9 delivers incredible response. With unprecedented realism in digital mixing and scratching, an array of effects that can be used simultaneously, digital output, and MIDI in/out for an entirely new way to unleash creativity and control, the AXIS 9 will unleash the digital DJ in you. 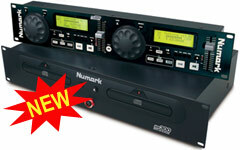 The Numark CDN25+G is a dDual rack mountable Professional Karaoke CD Player. Features include separate remote with interactive Pitch/Search wheel with finger grip. Dual composite RCA video outputs for CD+G karaoke lyric display. ±8/16% pitch, Sleep mode, CDR compatible. Power switch protector, All rubber buttons. The Numark DVD01 is a dual rack-mountable DVD player with ±50% pitch range, allowing DJs to beatmatch both DVD music videos and CDs. 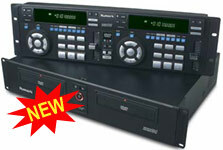 An on-board video switcher means that the DVD01 can operate without an external video mixer. With a proven, familiar interface based on Numark’s leading line of dual rack-mountable CD players, DJs can easily set cue points, adjust tempo, and match beats. All standard DVD menu controls are included, accessible with dedicated navigation buttons. There is also non-seamless looping for repeating desired clips. 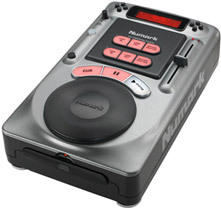 With its extensive USB mass storage connectivity, the Numark iCDX can be used as a vehicle to manipulate and store MP3 files. To further its USB connectivity, the iCDX comes complete with an adaptable docking station for iPod. 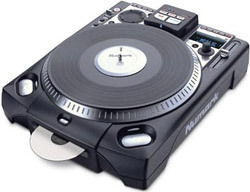 Complete with an illuminated CD/DVD drive for playing multiple disc formats and support for MP3, including ID tags, hot starts, seamless looping, and scratching, the compact iCDX offers DJs a higher level of control for playing music. This performance-oriented media player includes DSP effects, a touch sensitive scratch wheel, automatic BPM counter, a digital output, and a large LCD screen. 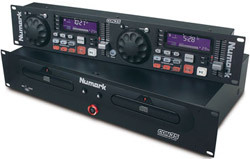 The Numark CDN88 is a professional rack mount dual CD player with optical jog wheel. Features include separate remote with REAL TIME SCRATCHING, Pitch lock, Built in Beatkeeper with auto-mixing/auto sync, 2 complete seamless loops with 3 hot stutter starts. Effects including:reverse -flange -warp -bleep- phaze- ISO- echo verb- chop -slide and kill. 3 cue points, fader and relay start, 48seconds buffer memory for anti-shock-instant start-seamless loop-hot starts, Digital outputs. Numark debuts the CDX, a tabletop CD player with an ultra-high torque motorized 12” platter that holds a vinyl record for the ultimate in vinyl scratch feel. Styled after Numark’s flagship TTX1 turntable, the CDX features an industry maximum 4.5kg/cm torque direct drive motor, aluminum platter, dual "battle-style" controls, and forward/reverse toggle. In addition, there is a superior VFD display, full MP3 compatibility, slot-load CD transport, and extensive DSP functionality. The CDX has several modes for scratching and looping, including auto beat matching and smart looping. There is extensive cue store/recall with multiple sets for each CD. The CDX also incorporates many beat-synched digital FX such as sonar, slide, filter, echo, and chop. Effects can be manipulated with a separate control wheel interface. 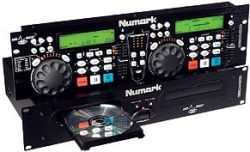 The Numark HDCD1 is a rack-mountable dual CD player with built-in 40Gb hard drive, capable of storing an entire DJ collection. MP3s and uncompressed audio files can be ripped from CD, transferred from computer over USB, or recorded through analog inputs. Two jumbo displays allow easy navigation for creation of playlists. 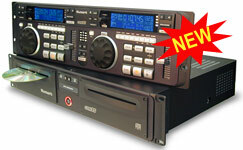 Other advanced features include pitch control, instant start, relay start, and seamless looping. There are multiple play modes fully compatibility with CDR Data (MP3) and CDRW discs.